I’d like to think my teenage daughter developed a love of hiking in utero, since I descended part of the Bright Angel Trail in the Grand Canyon when I was six weeks pregnant with her. I continued traipsing around easy trails in my local Colorado hills until the day before giving birth. 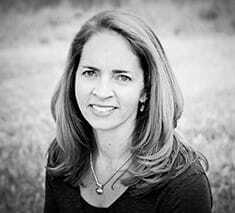 Still, my older child certainly didn’t emerge from the womb embracing the outdoors; I recall her screeching in the front-pack baby carrier, red faced and skinny legs kicking, when her dad and I attempted a short nature walk and lakeside picnic one June afternoon when she was one month old. That first short hike wasn’t a win, nor were the subsequent attempts at carrying her (and ultimately her little brother) along forest trails and desert paths. There were tantrums. There were bribes. There were tears (from both mom and kids). But we kept on keepin’ on because my husband and I absolutely love to hike. At home, it’s how we enjoy outdoor exercise. On vacation, it’s how we explore new surroundings. We knew we wanted to make hiking a family affair from the time the children were babies through their young adulthood. We had our hits and misses, for sure, but I’m delighted to report that, at age 13 and 15, both of my children actually enjoy hiking with us. My daughter recently announced that she wants to “camp and hike Mount Sopris again” this summer (that’s an Aspen-area, 13,000-foot mountain), and my son counts “hiking in Ireland” among his favorite memories from our summer in Europe sailing with Semester at Sea. 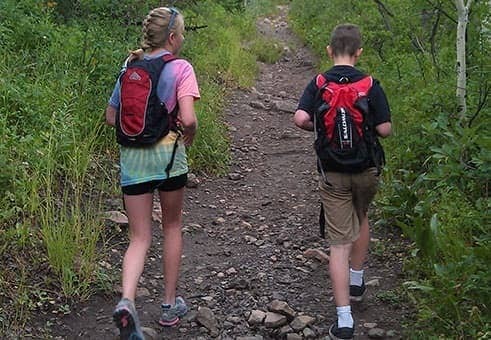 Here’s how we got our kids to love hiking. Start ’em young. Both children were carried in front packs when they were only weeks old, and then they graduated to backpack-style child carriers when they were toddlers. Instead of finding a babysitter to watch the children when my husband and I wanted to hike, we just took them with us. Make their first ‘on two feet’ hikes short. My kids’ initial hikes on their own were walking down our dirt driveway to our rural mailbox. I always made sure there was mail to retrieve. A reward (in this case, exciting envelopes to carry back home!) half-way through or at the end of an excursion makes a marvelous carrot. Waterfalls, cool rocks to jump from, sand dunes to roll down, an abandoned cabin or—best yet—a swimming hole, also work as fabulous rewards. Viewfinder Tip: Add geocaching to any family hike to make it more entertaining. Who doesn’t love a treasure hunt? Let them set the pace. This one can be a difficult tip to follow—especially if you’re out to hike for exercise. But when your children are of toddler or preschool age, you may just need to do your heart-thumping cardio workouts elsewhere. Toddlers find every rock, every bug, every flower wildly fascinating, and they’ll want to stop and examine everything along the trail. As often as possible, let them. Let them pick the conversation topics. When my son was 10 years old, he was obsessed with the video game, Minecraft. So when we took a family hike across volcanic rock on the Big Island, he and I hung back behind my daughter and husband, so I could hear all about the intricacies of mining obsidian and building fortresses in this beloved online game. Sure, I was bored to tears, but it kept his mind off the hot sun and the number of yards we were covering. Pack snacks. This is actually hiking-with-kids rule No. 1. Whether you take a bottle when they’re babies, Cheerios when they’re toddlers, or energy chews when they’re teens, bringing along food for the trail is key. Surprise snacks—things you wouldn’t normally eat at home, such as trail mix or or other sweet treats—go a long way when you’re encouraging the kiddos to go just a little bit farther. I’m not above promising dinner at a favorite restaurant or a stop at the ice-cream stand for a successfully completed (preferably whine-free) hike. Let them select the route. When there are choices—and you, as parents, are cool with either option—let your children pick which way to go. They’ll have much more ownership of the day’s events if they get to choose whether to take the shorter, steeper, longer, or more moderate route. The promise of spottng ancient rock art can spur a reluctant hiker. Keep them informed. My son likes to know all the details: How many miles is the hike? How long should it take? Is it a loop trail or an out and back? When do we get to stop and eat? We answer all his questions—as patiently as possible—and encourage him to wear a watch and follow along with tracking apps (such as Map My Hike) so he knows how much ground we’ve covered. Teach as you go. I am so fortunate to have married a man who readily can identify animal tracks, as well as types of trees, birds, insects, and flowers. On every hike we’ve taken as a family, I can guarantee my children learned the name of some flora or fauna. Wildflower or bird-watching books can help those less informed (such as me). Some families seek museums on vacation. Or they eat at fancy restaurants. Or they take in local theater performances. We research the best family-friendly hiking trails before we leave home, and we select accommodations for their proximity to recreation paths. Walking together is as commonplace to us as brushing our teeth before bed. For our family, making hiking part of our lives has not only resulted in our bonding over shared adventures on the trail, but also in the creation of a slew of common memories, all achieved while appreciating nature and exercising in the outdoors. How do you stay active as a family on vacation?